I am about to share the beauty of the internet and just how small NYC really is . . . 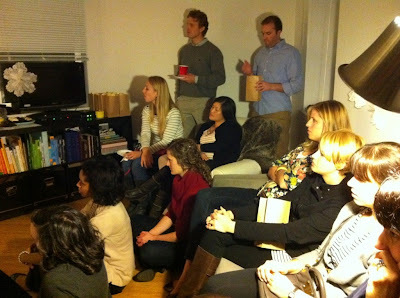 I had mentioned that on Saturday I attended a house concert at a fellow blogger's apartment. The concert was given by Mindy Gledhill - a beautiful artist with an angelic voice (check her out here). Anyway, the fellow blogger was Natalie, of Nat the Fat Rat. I've been following her blog for about a year and her son Huck is so wonderfully chunky! I enjoy seeing Natalie and Huck traipse around NYC as they too live on the west side and often remind me of Nia and myself. Last week I attended Pins & Needles crafting night and while there I saw an ornament that read "Huck" and immediately thought of Natalie. When one of the associates mentioned that there had been another baby there earlier who was very interested in eating the craft pieces as Nia had been I knew that indeed it must have been that Huck who I was thinking of. This looked like the perfect respite from playing nurse to Nia so I asked Mr. Love Bird if he minded and I emailed Natalie who responded yes, there was still room so I headed down to see the concert a mere two express stops away on the subway. It was a delightful evening and so cool to meet Natalie "IRL" (in real life). Natalie was a great hostess with all sorts of yummy snacks and Huck was in his PJs looking scrumptious as ever. I only stayed the first hour but the warm, cozy environment and soothing voices of Mindy and the opening performance of Spencer was so relaxing for a Saturday night. I slipped out quietly but saw the recap posted on Natalie's blog the following day. I don't think I would've been so brave as to invite internet strangers into my home, but I'm glad Natalie did! One touching part of the evening was when Mindy asked if anyone in the room was a blogger and I identified myself and she mentioned how the blogger Nie Nie's tragic story inspired her song "All About Your Heart" that was on the video of her testimony. This prompted me to go home and find it, and I've posted it below. After watching it Mr. Love Bird and I ended up having a serious conversation about cherishing life and being thankful in all circumstances and yes, a few tears were shed.